Will hasn't started this thread yet, so I'm taking the initiative. Ha! I'm very excited about this new timeline project, and I'm sure that many of you are as well. Here's an understatement: A lot happened in the past. How should the Past Timeline look? What kind of events should be included? What shouldn't be included? Should it be structured in a similar way to the Future Timeline (year by year close to the present, widening out to thousands, millions, and billion-year periods farther out), or should it take another form? It might, for instance, include multiple timelines based on different categories (warfare/politics, societies/economics, religion, science/technology, natural events, etc), or multiple timelines based on different regions (North America, Western Europe, East Asia, etc). So many possibilities. Any other ideas? Anyone else excited to check this out?? I think it's far too much to try and cover every area in history and would make sense to just focus on one or two, for example history of science and the universe. Trying to summarise the entire history of everything that's ever happened into a timeline would be impossible to do with any degree of quality. Other areas could then be discussed within a forum if people so wanted like with this site. Thanks for starting this thread. I've pinned it. This will be a massive project, so I'd welcome your input/suggestions. I agree with Shimmy, you could start off with the history of the universe and then scientific and engineering breakthroughs (things like Copernicus Heliocentric theory and woodblock printing) and once a decent template is established perhaps begin adding some cultural/political/economic revolutions. Don't forget also The Plague in the Middle Ages and WWI and II, Medical Advancements as well. Good point time traveller, the plague is a good early focus for the timeline. Also don't forget that time Nixon became president and that time Porto beat Deportivo La Coruna 1:0 in the 2004 champions league semi final. I must say I don't see the point, it's lot of work that has already been done. Future Timeline is an interesting project, something new and focused. Past timeline is... well right here: http://en.wikipedia....ry_of_the_world done. What's always interested me regarding history are the unseen links between seemingly separate events... Slavery is outlawed in Western Europe, so cotton becomes more expensive to produce domestically and is imported from the States. The South tries to use this advantage to get France and Britain to recognize it as a nation during the American Civil War, which would ratchet up pressure on the North to stop the war, but a crop failure in Europe at the same time caused corn prices to also rise, and corn was imported from the North. Protecting grain imports was more important than protecting cotton imports to the Europeans, so the Civil War was allowed to play out to its natural conclusion - a Northern victory, preserving the Union. The technology and strategies developed in this conflict would be refined and used to fight World War I, back in Europe, 50 years later. A crop failure in Europe may have saved the United States. Events like these are common throughout history. I'd like the see the timeline include these events, with links to the later events that were influenced. I think that this could be a good way to thin out the number of events that you might include in the timeline. For instance, several great global cities have been burned down over the course of history. Off the top of my head, Rome, London, Tokyo, Berlin, Chicago, Atlanta, and San Francisco have all burned down at some point in their history. For brevity's sake, some should be included, and some shouldn't. I'd select the ones that had a direct impact on later events or were such major one-time events that they just cry out to be included, so Rome, London, maybe Chicago, and San Francisco. On another note, there is a Kurzweilian emphasis in the Future Timeline. I think that should be included in the Past Timeline. Exponential progress should be demonstrated going back into the past. I'd also like to see a more global point of view. History books in the US (and I'll wager in Britain as well) place a huge emphasis on Western progress and Western history, giving only occasional nods to Islamic advances or Chinese dynastic history. The Islamic and Chinese worlds were way ahead of the West for about 1000 years. Have I mentioned that I'm excited about a Past Timeline? Because I am. Hm, interesting view about the civil war. I always knew there was more to it than slavery rights, and resource production actually makes a lot more sense. But, you have to be careful not to focus too much on the less-talked-about issues it's easy to veer off course. It will be hard to do ancient china and ancient anything because we are still learning new stuff about the past everyday! It will be hard to pick out a single Kurzweil in the past. Maybe Da Vinci? I know a lot of Nostradamus' "predictions" can be twisted to include many of today's events. But the people who predicted stuff in the past usually got a lot of it wrong. There are a number of different people you can list who progressed humanity. So maybe have a section entitled "Kurzweil's of the past" or something. Something you can do is talk about prophecy in general. The people of ancient times really up until the 1800s were so blinded by prophecy and religion, if somebody said something was going to happen in the future and it sounded plausible. They "had" to be right. Then everybody goes crazy trying to either fulfill the prophecy and/or make sure it doesn't happen. Christians today still look forward to heaven and the rapture! ^^ I am curious what the question mark for music 2060-2100 will be. I am curious what the question mark for music 2060-2100 will be. I think a past timeline would be interesting, but it would have to be whittled down in such a way that only majorly disruptive events are included on the list. The past timeline should be incremental like the future timeline. Going by single years between the years 1800-1999, and going by decades after that between the years 1500-1799, and 150 years between the years 1499-0000. After that massive timescales of 1000 years should be taken between 1 bc and 10,000 bc. 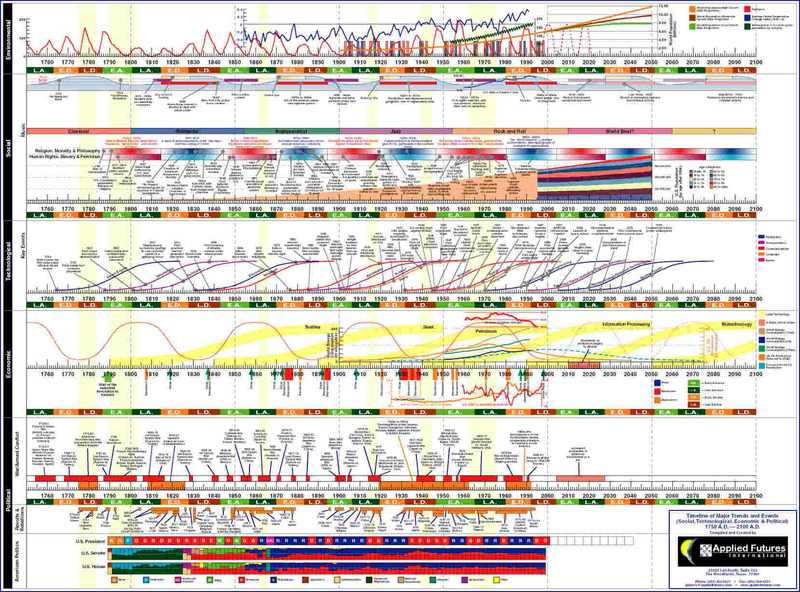 After that we get into evolutionary timescales, but evolution of the ancestors of our apelike ancestors is not very well known, but the if the information is out there, maybe the timeline could follow major evolutionary milestones in our ancestor's ancestor's ancestor's(think long before lucy). The history timeline also needs to have a chronology of our solar system's formation. Moving to galactic scale formation would be too challenging to timeline simply because we don't know what galactic collisions took place before the state its in now. I think this past timeline you want don't make sense,after all the name of the site is "FutureTimeline.net",so don't make much sense to say things that happened in the past such as ancient history,middle ages,I and II world wars,etc.I think begin the timeline since year 2000 is enough.After all,you wanna know about the past or the future? Edited by CyberMisterBeauty, 18 March 2012 - 11:08 PM. Presumably, Past Timeline would be an entirely new website running backward from around 2000. The name would be "pasttimeline.net". In fact, if you decide to take a look at http://www.pasttimeline.net/ you'll find it points somewhere familiar. Will already owns that domain name. It needn't be a total re-work or drastic alteration of futuretimeline.net in that case. This would be a totally new timeline. The question is, of all the enormity of events that have occurred in the past, what should be included, and what should be left out? I think it should start with the beginning of the universe and than only cover the biggest events. I have small suggestion on starting picture on past timeline. You know that black picture? There was so much energy in so small space at 10−43 seconds, so that picture is good to show universe at Plancks stage . Edited by raxo2222, 02 August 2012 - 12:16 PM.